No Fenders -Formula 1, IndyCar and A Whole lot more..: Checa Checks Out! Otay, I must admit – I’m extremely biased towards Carlos “THE BULL” Checa... 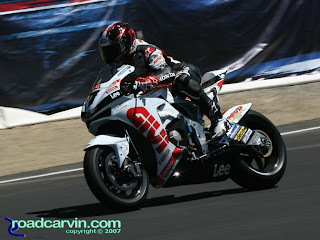 Especially now since my Numero Uno World superbike (WSBK) rider Ben ‘ELBOZ Spies has moved onto MOTO GP. And in ‘Juan more bit ‘O irony – can it already be time for another World Superbike season to be kicking off at none other then Down Under at Australia’s Phillip Isle; Hmm? Have I mentioned where I’m off to shortly yet? Yet even better yet as I sat down for my first 2hr block ‘O ‘Scooters; Whale – at least KneeDraggerz, since I have watched a couple of this year’s AMA Supercross events; it was great news for Mwah to hear that King Carlos as Messer Green would take to calling him during the broadcasts – had won the SuperPole shootout in convincing style... As reportedly the Island’s undulating, bumpy surface has always suited the ‘DUCs (Ducati’s) favourably. My notes were somewhat scattered – scribbling furiously during the ‘Mega commercial breaks... Noting that the day’s first race started off upon a damp, but drying track – with a terminal velocity of 312kph being clocked – as Steve “Wild ‘N Crazy” Martin noted that those are Monza style trap speeds – but we’re at Phillip Island! As Massimiliano ("Max") Biaggi put an exclamation point upon this by ripping off a ‘Mega 321kph down the straight, which is just a skosh under 200mph. (199.34mph) CRIKEYS MATES! That’s blistering fast, as Biaggi would use the Aprilia’s superior straight-line speed to mess about with a resurgent Marko Melandri; but I’m jumping the gun a wee bit here. Thus it was ‘The Bull motoring away from the pack and simply playing Hide ‘N Seek after dispatching the momentarily surprising leader Eugene Laverty; as the Irishman was making his WSBK debut – riding for the ‘YamaHopper Factory Sterilgarda Team. As Laverty, who finished runner-up in World Supersport in 2009-10 had a fantastic battle with his teammate Marco Melandri, with the two riders swapping fourth place back ‘N forth before Eugene nipped Marco at the stripe. The second race was more of the same up-front, as once again Checa sped away from the field, yet there was a most entertaining good ‘Ol Donnybrook going on for P2 between Max Biaggi and Marco Melandri. And although Melandri did manage to overtake his fellow Italian, Biaggi’s Aprilia’s terminal velocity was simply too great for Marco to overcome. As the elder Italian routinely slipstreamed the Yamaha with blasts between 319-321kph as Biaggi ultimately finished second with Melandri settling for third place. Honda’s Jonathan Rea finished fourth with Leon Haslam rounding out the Top-5 positions in Round-2. Noriyuki Haga finished ninth & seventh in the first two rounds respectively, while Eugene Laverty dropped to a disappointing 15th in Round-2, as I’ve got NO idea what happened? And while I’m sad that it’ll be a whole month between races, and I’ll miss hearing Messer Greene’s enthusiastic race calls alongside “The Chiller,” nee Steve Martin – who tries keeping Green from frothing over during the broadcasts... Nevertheless, I’m extremely happy to know that Donington Park has returned to racing status after some Gillette Dude tried giving the venue a close shave, Err more likely a bunch ‘O nicks and cuts! Ok, the track needed a massive tourniquet applied to it... So it’s very good news that the track has survived and is back in business! Meanwhile, NO word on where ‘Ol shakey Byrne disappeared too... Anybody out there know?